Please note that the 4-foot chain length on this toddler swing is designed for the club house or monkey bar playsets from Lifetime. 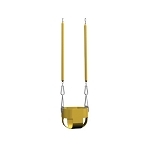 If you are ordering this for the A-Frame swing set from Lifetime Products, the chain length will make this swing much higher than the other swings, which use a 5-foot chain length. 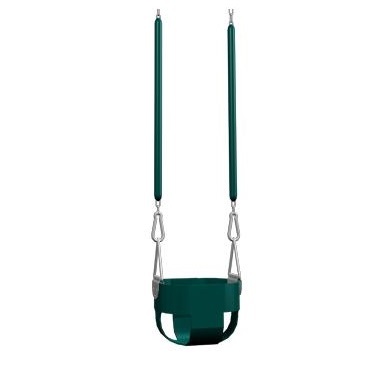 This full-bucket swing from Performance Design for Big Stuff Swing Sets comes in Bright Green to coordinate with the Earth tone Play Sets. Also available in Yellow, model number 412000, to coordinate with the Earth Tones Play Sets. Replaces model 8000013. 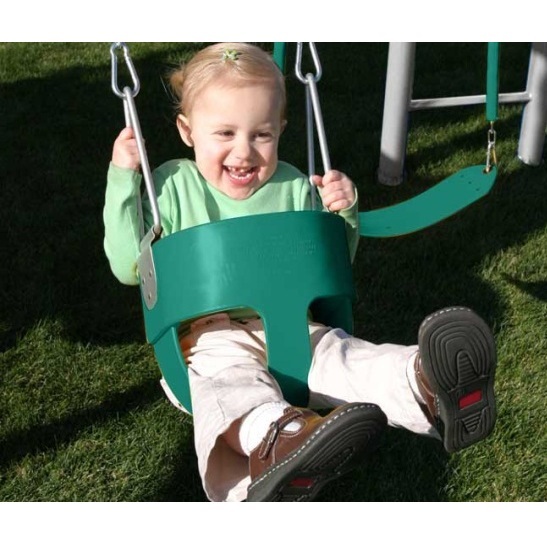 The 412000 Toddler / Infant Swing with encapsulated chains is recommended for ages 0-5. Competitive Edge Products, Inc. is an authorized retailer of the Big Stuff 413000 Infant / Toddler Swing on other Big Stuff playground equipment. A quality product at an attractive price. We are very pleased and would purchase this product again and recommend Competitive Edge Products, Inc. to my friends. Received our swing. Just love it. Great value. Thank you. Got the green for a shower present, put a Spartan sticker on the front and it made a great MSU swing for my new grandchild. Do not hesitate to order this swing. Beyond our expectations. Worth every penny. Great foe infant on up. Bought this a month ago for my 2 year old granddaughter. She loves it, says she can swing high like her older sisters. Love the safety features and ease of use. Grand kids love it and we feel secure in using it, even with the youngest. My daughter loves this swing! I highly recommend it to anyone in the market. We removed one of the 3 regular swings with a Infant/Toddler Swing. The smaller swing matches perfectly with the existing Lifetime Swing set. We tried my granddaughter in it at age 3 1/2 months and she was still a little small for her, we had to prop her up with blankets, but she loved it and will enjoy it even more as she gets older. Great purchase! Q: How sturdy is this? Is there a weight capacity? A: Although this is designed for little ones, it is very heavy-duty. There is no weight capacity for it below 150 pounds. In other words, it will hold you just fine if you can fit inside. Q: Can I interchange this quickly with the belt swing for the trapeze bar or do I need special tools? A: It can be changed very quickly with one person on a stepping stool in a matter of seconds. It simply uses heavy-duty galvanized carabiner's that simply click on. Fast Shipping: Orders for the Big Stuff Bucket Swing generally leave the warehouse the next business day.